The nice things about dryers is that unlike many other appliances, they’re a relatively simple appliance that most homeowners can learn how to maintain, troubleshoot, and even repair on their own. All it takes is a little confidence and a willingness to try. You shouldn’t wait until your dryer starts acting up to check out the vents. 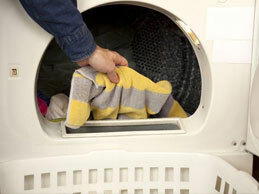 Improperly vented dryers or dryers with a large buildup of lint can be huge fire hazards. Taking the time to check and clean the vents once a month could save you all kinds of hassle and stress down the road. In addition to making sure that your dryer is pushing air all the through the vents and into the outdoors, you will also want to peer behind the dryer and make sure that the hose hasn’t somehow become kinked, which will impede your dryer’s ability to vent properly. The other thing you should know is that when your clothes don’t seem to dry completely, and you suspect that the issue could be with the thermostat, you will actually have to check three different thermostats. The cycling thermostat will be what keeps the temperature inside the drum between 125 to 165ºF. If that thermostat seems to be in good repair, you will want to check out the hi-limit thermostat which prevents your dryer from overheating, and the non-resettable thermal fuse which will either shut down your entire dryer or just the heating element. When the dryer fails to tumble your clothing properly, the exact cause of the trouble tends to be determined by the brand. White-Westinghouse dryers often fail to tumble properly because their flat belts surrounding the drum have worn very thin, almost to the point of breaking. When the reason for the failure to tumble is the belt you should get it replaced, don’t try to mend it. A burned out motor could also be the source of your troubles. This can be easily identified by the fact that the dryer will sound extra noisy and it won’t tumble your clothing. More often than not, the motor can’t be repaired and will need to be replaced, which will still be more economical than getting a new washing machine. It’s amazing just how noisy a dryer can become. The first thing you need to check will be that it’s properly balanced. If you have a Whirlpool/Kenmore check the idler pulley as well as the front slide kit. All brands of dryers tend to be prone to idler puller burnout which you’ll be able to identify by the high pitched squeal coming from your dryer.